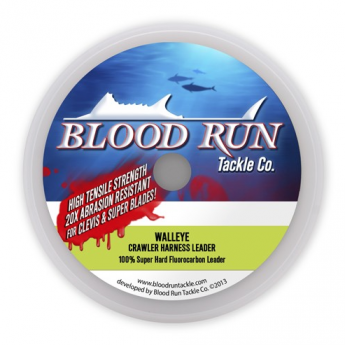 Walleye Harness Leader Material from Blood Run is a custom fluorocarbon leader material for tying crawler harnesses specifically for Walleyes. Our crawler harness fluorocarbon leader material is manufactured differently from our standard fluorocarbon leader. Clevis, Blades and Walleye all wear and tear on standard harness leader line in a different manner than typical leader material which put us to the test to design this line specifically for this application. The new Crawler Harness Leader Material from Blood Run puts the best qualities of our unique fluorocarbon manufacturing process to make the perfect crawler harness leader at the right price. 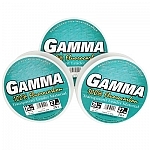 Fluorocarbon is known as an abrasion resistant and durable low stretch leader material. A drawback for harness fishing is the low stretch and hot friction from 100% fluorocarbon leader material knots which can burn the line creating weak spots. 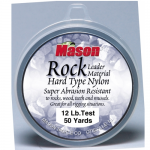 A drawback for pure monofilament is the high stretch low abrasion resistance which can be cut quickly by toothy walleyes, quagga mussels and other abrasive structure. Combining the right mixture of both provides the perfect balance of fishability, usability and affordability that was meant to pull meat! 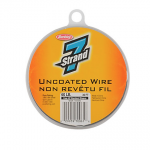 Available in clear 20lb test 100 yard spools.